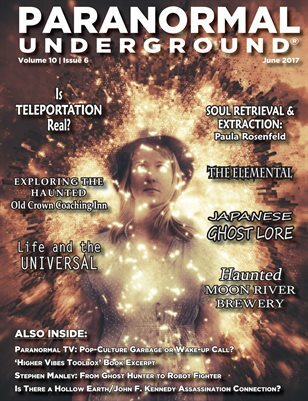 In this issue of “Paranormal Underground” magazine, we spotlight Paula Rosenfeld, Deeksha Giver and shamanic practitioner of the art of soul retrieval and extraction; actor Stephen Manley of the films “Ghosthunters” and “Rogue Warrior: Robot Fighter”; and paranormal mystery writer Deanna Chase. In our Case Files of the Unknown, we feature the haunted Moon River Brewery and a conspiracy theory that asks: Is there a hollow Earth/John F. Kennedy assassination connection? We also take a look at whether teleportation is real; a shaman’s experience with an elemental; how we limit ourselves with labels; how our lives connect with the Universal; and how haunted locations affect our senses. Also in this issue, don’t miss our coverage about Japanese ghost lore, the Haunted Old Crown Coaching Inn, an excerpt from the book “Higher Vibes Toolbox” by Karen Frazier, and a guest editorial that asks: Paranormal TV: Pop-Culture Garbage or a Wake-up Call? For our digital archive, visit paranormalunderground dot net!